LP version. Transparent splatter vinyl. 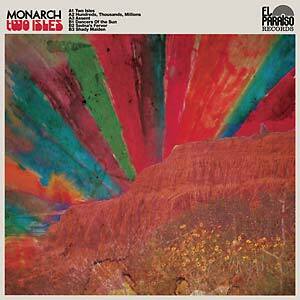 No other band channels the color, warmth and energy of the coastal SoCal scenery as well as San Diego's Monarch. Their debut album Two Isles was recorded and produced by local glitterati Brian Ellis. It's full of breezy Allman Brothers guitar leads gliding effortlessly on top of gentle, and sometimes not so gentle, prog-rock structures. With supreme musicianship, they somehow connect the dots between classic California rock, prog, pastoral pop and the vivid, expansiveness of early 1990s British shoegaze. Indeed these guys have created something that transcends sounding like a time capsule. While psychedelia might be the prism that everything is projected through, Two Isles reveals the fact that this is a group of people who grew up on a wide range of sounds available in the diverse San Diego scene: ambient, indie, math, jazz and whatever else was available to experience.